Chromebooks are very interesting since you’ll be able to run the Google Play Store with its android apps on it now. 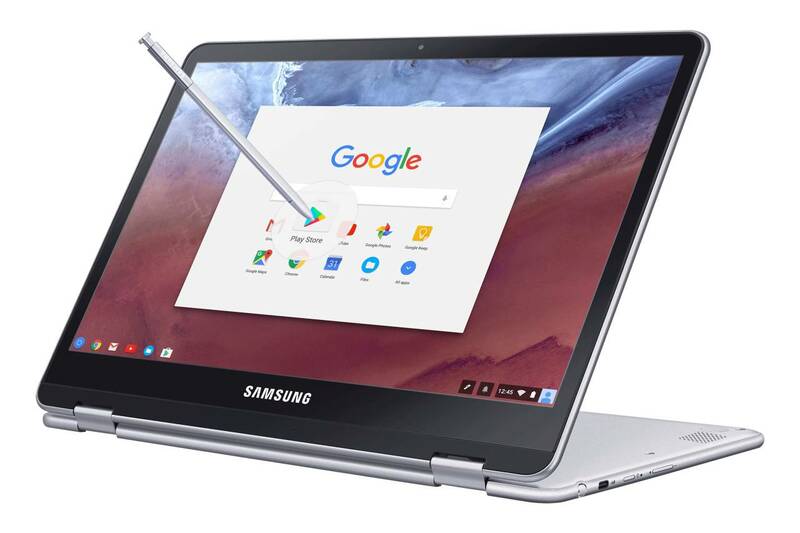 One of those new devices are the new Samsung Chromebook Plus and Chromebook Pro which both run Chrome OS and are 2-in-1 convertibles with touchscreens that can rotate around 360 degrees on the back of the keyboard. Samsung is offering both of these with a stylus that looks very similar to the S-Pens of the Galaxy Note series. As you can see on the official press images, the Chromebook Pro and Plus are both quite thin, made out of metal and look very well made. That’s hope that the build quality is good in reality too. There are two USB Type C ports on the side, a microSD card slot and a slot for the active stylus. There’re not a lot of differences between the Samsung Chromebook Pro and Chromebook Plus. The later one will be released first and comes with a hexa core ARM chipset with two Cortex-A72 cores and four Cortex-A53 cores. With the Pro you get Intels Core m3-6y30 processor from the last Skylage generation. No Kaby Lake here. Both of them have 4GB of RAM and a 32GB internal storage. While the memory should be enough for Chrome OS, the internal storage is a bit small. Not for Chrome OS, but you might need a bit more in this case since you want to install android apps as well. Let’s say you use Lightroom mobile – there has to be enough space for pictures to edit. The display of both devices is 12.3 inches and has a resolution of 2400 x 1600 pixel. As you might expect this is an aspect ratio of 3:2 which we also see with Microsofts Surface series. You’ll be able to buy the Chromebook Plus in February starting at 449 USD. When the Chromebook Pro will be in stores is not announced yet but it should be some time in spring. We don’t know any price for this one yet.